"A consumer favorite when it comes to wiping impurities out of your H2O." "It removes contaminants and adds some minerals back into the water." "Just install it on the faucet and forget about it." "It’s nearly impossible to install this filter system incorrectly." "Small enough to fit in the refrigerator and fills up quickly." "For filtered water on the go, a simple water bottle is all you need." 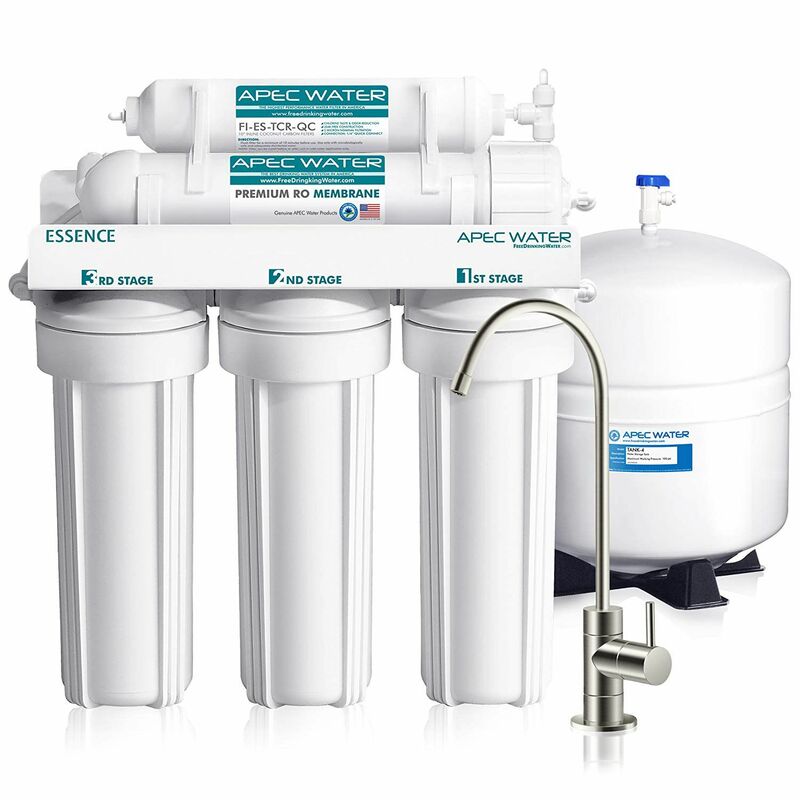 One of the best water filters available today is the APEC Top Tier 5-Stage Ultra Safe Reverse Osmosis Drinking Water Filter System. As mentioned in its name, this system puts water through an impressive five stages of cleansing to remove 99% of contaminants, making it a top choice among homeowners. The APEC Top-Tier 5-stage Water Filter System can be installed right under your sink, and it uses both reverse-osmosis and activated carbon to remove 99% of contaminants, including arsenic, chlorine, lead, chloride, heavy metals, bacteria, viruses, and more than 1,000 other common contaminants. Its long-lasting filters can be used on both tap and well water, and it features a leak-free quick connect fitting that makes it easy to install. With this water filter system in your kitchen, you'll feel like you were drinking bottled water all the time! Another amazing water filter that many people swear by is the APEX Countertop Drinking Water Filter. This product gets top marks from reviewers who say it effectively cleanses their water, leaving them with aqua they can feel good about! The APEX Clear Countertop Alkaline Drinking Water Filter System is easy to connect to the kitchen faucet, and it sits on your counter, removing contaminants commonly found in tap water. This water filter system is effective on chlorine, sediments, radon, mercury, pesticides, and water-borne illnesses. Reviewers love that this product is easy to install, and many say their water now tastes fresh, smooth, and clean. The only downside of this product is that it's only recommended for use on cold water. Does your family go through a lot of water each day? If so, the high-capacity CuZn UC-200 Under Counter Water Filter may be a good option for you. This water purification system connects directly to your kitchen sink’s cold water pipe in just a few minutes, and it's designed to purify municipal water. It uses a 3-stage filtration process to remove all sorts of contaminants, including chlorine, lead, mercury, chromium, cadmium, herbicides, pesticides, sediment, algae, molds, bad taste, odors, and more. Plus, this water filter can be used for up to five years! Reviewers say that this is a heavy-duty, high-capacity water filter that leaves questionable water tasting as fresh as ever. The only downside is that it's only for use on public water supplies—not well water. If you don't want to go through the hassle of installing a water filter to your pipes, you can purchase one that hooks up to your faucet instead. For instance, the PUR PFM400H Chrome Horizontal Faucet Mount is an easy-to-install water filter that can remove dozens of common contaminants from drinking water using activated carbon. All you have to do is screw this water filter system on to your kitchen faucet—there are no tools required! The PUR Filter well then remove more than 70 contaminants from your water, including 99% of lead, plus chlorine, mercury, and pesticides. Each filter can be used on up to 100 gallons of water, so the manufacturer recommends replacing the filter every 2 to 3 months. Reviewers say that the unit is sturdy, easy to install, and doesn't leak, providing fresh, clean water every time they turn on the faucet. 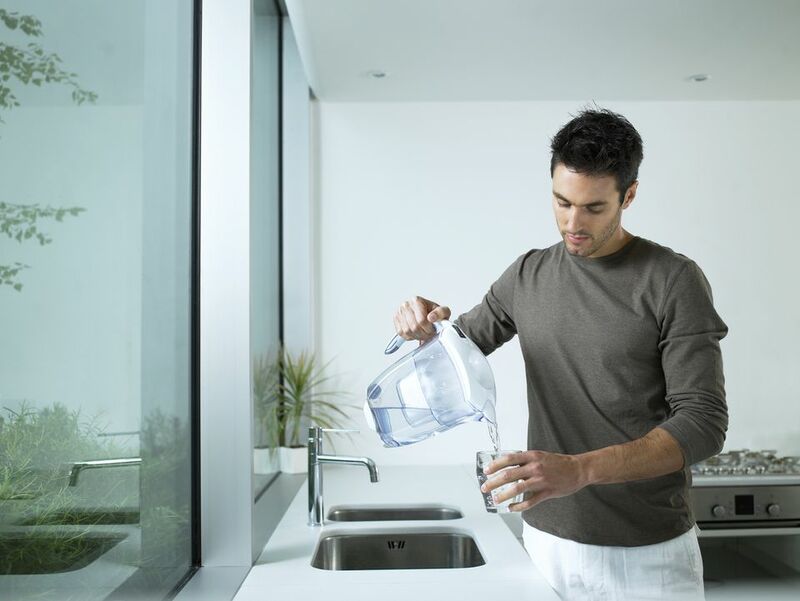 It couldn't be easier to install the Brita On-Tap Faucet Filtration System. In just five simple steps, this unit attaches to your kitchen faucet, allowing you to filter contaminants out of your water every time you turn it on. The Brita On-Tap Faucet Filter uses carbon to remove common contaminants like lead, chlorine, asbestos, and more from your drinking water. The unit simply screws onto your kitchen faucet, and one filter can be used on up to 100 gallons of water. As an added bonus, it includes a built-in filter indicator that lets you know when to replace the filter. Reviewers say this product leaves their water tasting cleaner, and many love how easy it is to install and use. If you have a family, you probably go through quite a bit of water every day. As such, you need a heavy duty water filter, such the Berkey BK4X2-BB Big Berkey Stainless Steel Water Filtration System. This unit is recommended for small to medium-sized families, and it can be used on both treated and untreated water sources. It's effective at removing a wide range of contaminants from your drinking water—it gets rid of everything from harmful chemicals like pesticides to pathogenic bacteria, parasites, heavy metals, and more. The unit has a holding capacity of just over two gallons, and its cleanable, self-sterilizing filters have a lifespan of up to 3,000 gallons. If you love spending time in the great outdoors, you know how beneficial it can be to have a portable water filtration system on hand. With a product like the Sawyer Products Mini Water Filtration System in your pouch, you'll be able to sip on water from any freshwater drinking source without worry. This personal water filter weighs just 2 ounces, so it's not a burden as you're hiking through the wilderness, and it's incredibly effective, removing 99.9% of bacteria and protozoa from water. Plus, each filter can be used on up to 100,000 gallons of water, and it easily attaches to standard water bottles and drinking pouches. According to reviewers, this is the perfect personal water filter for camping, backpacking, and other adventures, and well worth the low price! If you don't want to shell out money for a filter that attaches to your plumbing, you can also opt for a water filter pitcher. One of the most popular, highly-rated options among consumers is the Brita Small 5 Cup Water Filter Pitcher, which you can get for around $20. All you have to do is pour water into the pitcher, and its filter will reduce contaminants like copper, mercury, and cadmium, as well as the taste and odor of chlorine. There's an electronic indicator that tells you when to replace the filter, and each filter is good for about 40 gallons, which lasts about two months in a standard household. Reviewers love that this pitcher is small enough to fit in the refrigerator and fills up quickly. Plus, most agree that it improves the taste and quality of their drinking water. What’s not to love? There may be some instances when you only need to filter one serving of water—like at work or on vacation. In this case, your best option may be a water filter water bottle, such as the Brita Hard Sided Water Bottle. This handy 24-ounce water bottle is made from BPA-free hard plastic, and it has a built-in carbon filter that will remove impurities from up to 40 gallons of tap water. The water bottle is dishwasher safe, and it fits in most car cup holders. The manufacturer recommends changing the filter every two months, and reviewers say it's the perfect water bottle to take on vacation to areas where you might not have clean tap water. Our writers spent two hours researching the most popular water filters on the market. Before making their final recommendations, they considered 18 different water filters overall, screened options from 15 different brands and manufacturers, and read over 50 user reviews (both positive and negative). ﻿Our reviewers tested the top-rated water filter by using it daily for a week. We asked our testers to consider the most important features when using this filter, from quality of the water to the filter's overall value. We've outlined the key points so that you, too, know what to look for when shopping. Permanent vs. pitcher Permanent water filters attach to your sink, so there’s no need to remember to refill a container for making coffee or tea. However, since they filter all the water from your tap, you’ll be using filtered water for everything. Pitchers and small containers that just filter the water you’ll use. Impurities filtered Different filters can remove different contaminants. The simplest ones can help your water taste better by filtering out basic impurities. If your water supply is questionable, you can find filters that remove bacteria and dangerous contaminants as well. Filter lifespan The downside of using a water filtration system is that you need to replace the actual filters on a regular basis. Before you buy, it’s good to know how often the filter needs to be replaced, and it’s wise to buy filters and have them on hand for when you need them. “This filter has given us water that is as good or better than the large bottles of spring water we'd been buying,” one tester revealed. In addition to the water quality, reviewers liked that once it was set up, the separate faucet was easy to access, with the filter system fitting nicely underneath the sink. The one negative, according to our reviewers, was the time-consuming installation, but, overall, they thought it was worth the price tag: “We'll have to buy new filters, but we'll still save money in the long run by no longer buying bottled water,” one person noted.